Hassan Joho escapes death after a bomb set on his personal car explodes and killed his driver. - Bana Kenya News, Real African Network Tubanane. Home Mombasa Hassan Joho escapes death after a bomb set on his personal car explodes and killed his driver. 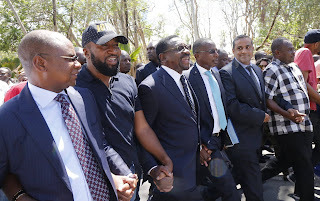 Hassan Joho escapes death after a bomb set on his personal car explodes and killed his driver. A-Bomb placed in Hassan Joho's Personal car and later exploded and killed his driver. The Bomb was set on his car by unknown people. This comes after 5 civilian people with Guns were spotted on his former residential house in Nyali. Another driver is lost and it is not known who are the people who kidnapped him. The Mombasa Governor escaped death and the bomb exploded in his car and killed a 33 years old driver. The civil society and coast leaders are demanding a thorough investigation on the matter. Tony Katana, a primary student at Harvard school in Nyali was shot dead by 3 police officers claiming that he was attacking them with a machete. Nyali Deputy OCPD Walter Abondo claimed the boy was a gang member which the residents declined the statement. Human Rights activists said the investigation so far does not inspire hope and accused the Criminal Investigation Department of trying to sabotage a probe by the Independent Policing Oversight Authority (IPOA). “We are not sure whether a credible probe shall be conducted,” said Hussein Khalid, Executive Director of Haki Africa. Khalid was referring to the tussle between the CID and IPOA on the custody of police fragments recovered from Katana’s body early this week. He said the boy’s killing was puzzling because he was “finished off” after the first bullet hit him in the waist. “He was already writhing in pain. Police did not have to kill him,” said Khalid. Mombasa Governor Hassan Joho claimed the State has introduced confusion in the investigation. The Governor yesterday took the bodies of his driver and the student from the Mombasa General Hospital Mortuary and they will be buried at different dates yet to be given out. The majority of people in Mombasa are asking the Police and IPOA to commence and give out comprehensive investigations.